Is Your Catering Salesperson Undermining Your Success? I have clients and potential clients who employ catering sales reps. The amount of catering success these salespeople achieve are all over the board. Some restaurants and catering companies are really able to propel their catering sales with the right rep. The wrong choice costs you time and money. Think about what it costs to bring on a new hire, train them, coach them, etc. Every day they aren’t producing for you is a day of catering sales you will never get back. So how in the world can a catering salesperson be undermining your catering success? Well, there are two types of salespeople: hunters and farmers. Other people prefer to use the term order taker versus sales person. The universe of sharp people with excellent customer service skills, the ability to sell/upsell over the phone is far greater than the number of people who enjoy and are good at building sales via prospecting and lead generation. Now I am not advocating cold calling or a purgatory of endless door knocking. What I am talking about is the difference between a professional visitor or salesperson as the late Zig Ziglar calls them. 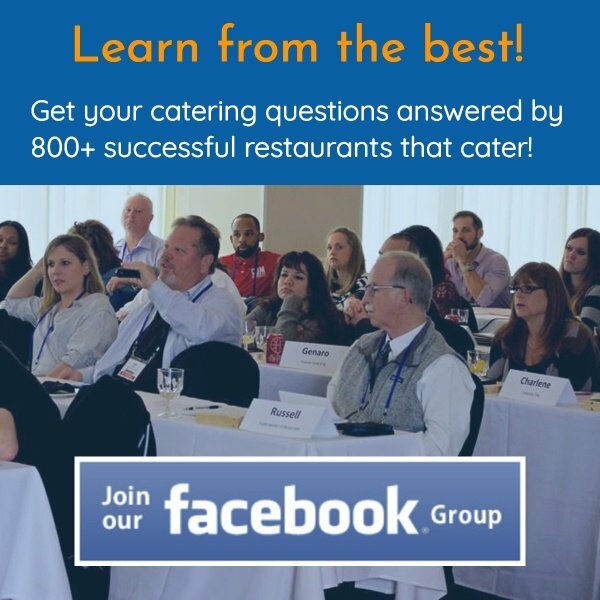 What type of person would best help you reach your catering sales goals? On average, you should be able to generate ten percent of your sales in catering without doing much. Now what do I mean by much? Create a good catering menu that is easy for your customers to understand and order from, as well as, is simple for your staff to take orders from. Use 4 Walls Marketing: Most of the people I consult aren’t using table tents, signs, banners, washroom signs, staff buttons, messages on hold, flyers for takeout orders, etc. to educate their current customers that they offer catering. Never assume your customer knows everything you do. Every great retailer knows how to use point of purchase to cross sell their current clients. Do a good job. As basic as this sounds: be easy to work with and likeable. Show up on time. Set things up for them. Make sure they have plenty of food. Make sure the hot food is hot and the cold food is cold. And please leave nothing off an order. Minimal Catering customer service. A thank you letter here or a follow up phone call there. Return their calls promptly. If you do these four things, you should be able to grow your catering sales to the ten percent range. An order taker should be able to facilitate growing this, but will spend most of their time handling inbound calls and proposal requests. If you are at a place you really want to grow your catering sales, you will want to invest in a catering “sales” person. This person is not afraid to prospect or talk to people who haven’t called them first. 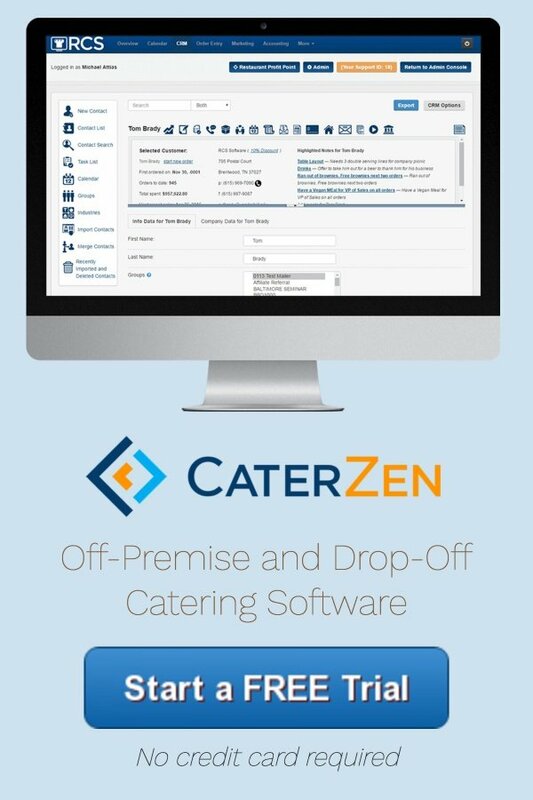 With our new Sales Tempo Tool, you or your catering salesperson is only focused on working with people in your city they know cater. Yes. The list is over fifty percent of the equation, and we help our clients with that. By using direct mail, cookie drops and LinkedIn touches to connect, you’re never making a cold call. It’s a warm call at worst. By only focusing on catering buyers, you avoid the frustration of having to knock on a hundred doors or make a hundred calls to uncover one good catering prospect. If I am striking out 99% of the time, it beats me down. If I can be successful 20-30% of the time, then it’s fun. Are you fooling yourself into believing little Ms. Order Taker can go out and hunt catering opportunities? Did you sell yourself on their abilities or did they sell you a bad bill of goods? How can you tell an order taker from a true salesperson? It’s how they talk to you. Often times my consults involve the restaurant owner and someone they have hired to do catering sales; either part time or full time. The salespeople get excited about our tools. They realize we are providing a machine gun for the knife fight; not a plastic knife. They are not scared their sales activities will be monitored. They welcome you listening to recordings or their calls. Every great achiever has coaches and needs feedback. The people afraid of actually selling catering make excuses and try to undermine a system like ours. Would I love for every person reading this blog article to work with my company and our systems? Absolutely! But more importantly, whether you work with me today or years from now, I want to use this forum to educate and help you. That is what has brought us successful clients. Only you know where your business is and what you need. Please do not fool yourself into thinking your order taker is going to be a sales shark. You will both fail. Meredith has been with me for fifteen years. She started out as a hostess at my restaurant. There are a thousand things she does incredibly well. Sales is not one of them. She knows it. I know it. Forcing her to make calls would be akin to wrestling with a pig. The pig gets pissed, and you get muddy.